We’re working on a local farm this summer in exchange for space to grow our own produce, which these days we harvest in over-abundance. The zucchini, kale, and chard all grow faster than we can eat, so we traded some friends a basket of greens for potato spuds just ready to plant. At our Grow Your Own Food Class the next day we planted the potatoes with local kids, who will come back to tend them and harvest later in the year. Our small garden at the Brick House Community Resource Center will yield food to share around the neighborhood. This is just one instance of the generosity and interdependence we have experienced this summer. 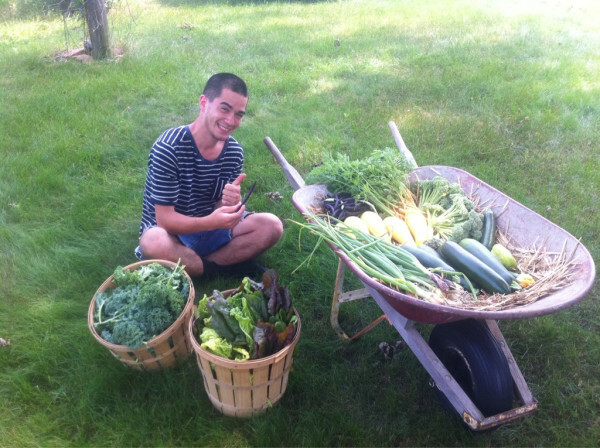 Duncan with some of our latest produce. This Saturday, I’ll be heading to Worcester, Mass. for the Green Solidarity conference. As programs across the country engage in a Day of Action, I’ll be sitting in with innovators, activists and organizers from Massachusetts to learn, and contemplate further how people can transform our economy to work socially and ecologically. How can the benefits of cooperation and solidarity I have enjoyed this summer extend to the larger community? Coming from an environmental organizing background, and as a student of political economy, I believe that structural re-invention of our economic system is necessary to halt environmental destruction and environmental racism. It won’t be possible to buy our way to sustainability. Change is needed beyond a “green” makeover of our current economic system. To sustain ourselves and the earth, we need an economy that functions to meet peoples’ basic needs and aspirations. When the demands of capital and profit drive an economy these needs aren’t met. I refuse to believe we have no other options. I see the change we need in the solidarity economy movement. It originated with people’s movements in Latin and South America to self-organize economic activity to meet basic needs, when state government and structural adjustment programs failed them. My definition of a solidarity economy is an economy people own and operate with the understanding that their self-interest is bound up in the interests of their neighbors- both down the street and around the world, both human and non-human. A solidarity economy is made up of many parts- cooperatives, non-profits, mutual aid societies, land trusts, extended families. What binds it together is the understanding that working in solidarity will yield far greater benefits than pursuing self-interest and profit. The work we are doing as Pioneer Valley Summer of Solutions is helping build the solidarity economy in our community. We are hosting free classes through the Summer Workshop Series, on practical and sustainable topics; we are learning to fix bikes and make them available as affordable local transportation; were using the Time Bank to share goods and services; we are supporting local farmers by helping grow their produce, and consuming it. Working together, we as a community can meet our needs, and make sure our neighbors are able to do the same. As we work to meet the needs of our local community, we in turn understand the importance of environmental stewardship. I can’t wait, on this year’s Day of Action, to explore how we can bridge the work of the solidarity and green economy movements. Sounds like a task worthy of Summer of Solutions Pioneer Valley! This entry was posted in Local Programs by Martha Pskowski. Bookmark the permalink.